Got an email from Ashley of ZipFizz to review their energy drink mix. Which is to say, you snap! Remove the cover of a little tube. 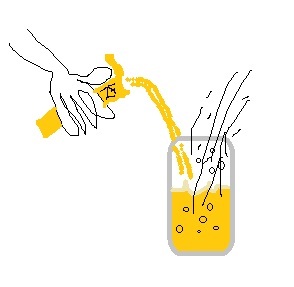 Then, tilt and pour into a bottle of water. And no, despite the illustration, you do not need a degree in chemistry. Perhaps you've seen this type of product before? I almost bought a similar product. Which depends on your definition of "bought." Because I selected a similar product at the local running store. Left it on the counter by accident. Which made it all the better to receive a sampler pack of this tasty energy-packed product. You can get one, too. For free! And other flavors you can find right there on the ZipFizz website. First I had to try the LIMITED EDITION Orange Cream flavor. Drank it during a 7ish mile run to start my Saturday. It was happiness in my mouth. That same day, I really put ZipFizz to the test. Following that empty stomach run in the morning, I decided not to eat prior to a 1-mile afternoon race in town. I gulp! Drank the berry flavor during the race. The tube conveniently fit into my handheld bottle's zipper compartment. And zoom! I PR'd the race! OK, that was my first timed mile. Still. You can't argue with those results! In fact, a few days later, I drank some ZipFizz while swimming laps before work. And while I didn't notice any additional Zip in the pool, I felt great when I got to work. Alert and happy. Alerter and happier than usual anyway. Well, if you want to try out an all natural energy drink, which includes natural caffeine, ZipFizz will hook up 2 lucky giveaway winners. Two simple rules to win. I'll pick 2 random winners on 1/30/2012. How much B12 does this product contain? Well, 2500 micrograms per serving. Exactly, we're talking bam! 41,667% the recommended daily value. A boost of energy. And it can probably treat a minor case of cyanide poisoning. Thank you to ZipFizz for the delightful product review opportunity and for rewarding two loyal readers with their own free sample pack. sounds tasty to me - off to "like" them. never know when you may have a little cyanide poisoning to clear up. oh and congrats on the "mile pr"!